It's been a couple of weeks since we didn't see David Tennant in the Royal Shakespeare Company's production of Hamlet (if you've been living on the moon he's got a bad back and any rumours that he went into hiding to avoid us are just pure speculation). So did a matryoshka doll-like cascade of understudies harm the production when it moved to the Ivor Novello Theatre? Just to clear things up, so there's no confusion, Hamlet was played by Laertes, Laertes was played by Guildenstern, Guildenstern was played by Lucianus (the poisoner in the play) and Lucianus was played by Fortinbras. Hope that's nice and clear. What we did get was a very polished production (literally in the case of the set) despite the re-arrangement of cast. Patrick Stewart as a very statesman like Claudius was magnificent and Edward Bennett stepping into Hamlet's jeans/tux (no doublets and hoses here) certainly didn't cause the production to be any less enjoyable. At his best when interacting with others as a slightly whiny brat; his verbal bullying of Polonius (Oliver Ford Davies) was a delight. The interplay between Polonious, Ophelia (Mariah Gale) and Laertes (Tom Davey) as fatherly advice is dispensed was also wonderfully done. For the second time in two days I found myself laughing out loud at a production of Shakespeare. In a tragedy it's obviously not all laughs. Penny Downie as Gertrude developed as the production went on from a rather unsympathetic woman who'd hurriedly re-married in order to maintain her position to a woman genuinely torn between her new husband, her son and her grief for the old. Was it perfect - no probably not. The opening scene with the guards using the highly reflective floor to bounce their lights off to illuminate the faces of their compatriots instead of using the stage lighting should have worked well, but the constant switching between faces ended up just being irritating. The mirrored backdrop was put to particularly good effect in 2 scenes, although the latter of those was so nicely done that I did spend the next 15 minutes wondering quite how they'd done it, thus distracting me from the main event. But then I'm a geek at heart. However it did have the best use of a slinky in dramatic arts this year. I sat through a year of Hamlet at school. Even now I could probably rhyme off a dozen quotes to scatter through an essay on the subject. But did I enjoy studying it? Hell no. Now I don't know how much of that was due to me being 16 or having the world's worst English teacher. But having now seen Shakespeare performed in a number of quality productions I firmly believe that we did it no service by the way I was taught it in school. I just hope it's taught a little better now. 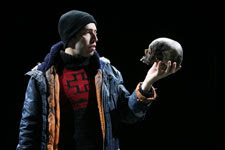 Hamlet continues its sold out run until January 10. Photo by Ellie Kurttz. Used with permission.